Salut, and welcome to our lesson about French verbs at Language Easy! They are a very important part of the language indeed, because they allow to express actions. It’s a quite a complex thing to master because there are a lot of forms variations, but keep calm, you’re in the good place, we’ll explain it all to you in details. What are French verbs ? Qu’est-ce que les verbes ? Verbs (les verbes) are words that express an action, a state of being, a becoming of an entity (or groups of entities), called the subject (le sujet). Action verbs (les verbes d’action) express actions that are done or undergone by the subject. State verbs (les verbes d’état) express a state of the subject. Bien sûr, la pomme a été lavée. Of course, the apple has been washed. Malgré cela, les soldats demeurent calmes. Notwithstanding, the soldiers keep calm. French verbs can vary a lot, including in number and in gender according to the subject, and many elements must be taken into account when one has to choose the right form to use. The voice (la voix) of a French verb expresses the role that the subject plays in the action. In the active voice (la voix active), the subject does the action, while in the passive voice (la voix passive), the subject undergoes the action. Le champs est cultivé par le paysan. he field is cultivated by the peasant. C’est-à-dire que le paysan cultive le champs. That is to say that the peasant cultivates the field. Apart from infinitive, there are six different other moods, the most common being the indicative (l’indicatif) that describes actions that are happening in reality. The tense (le temps) of a French verb denotes where in the time-line the action is situated : in the past, in the present, or in the future. Marc voyagera à Paris le mois prochain. Marc will travel travel to Paris next month. Marc y aura été trois fois. Marc will have been there three times. En y allant, il s’arrêtera certainement chez sa mère. Also, you can refer to the sections of this grammar manual corresponding to each mood to learn more about all the tenses of French verbs. In a use case of a French verb, the grammatical person (la personne grammaticale) represents the relation between who is speaking or writing, and the grammatical subject of the verb that he’s using. Finally, at the third person, the subject of the verb designs a third person (singular) or group (plural). Of course this doesn’t apply to the three impersonal modes (les modes impersonnels), infinitive, participle, and gerund, which describe an action without anyone doing the action. 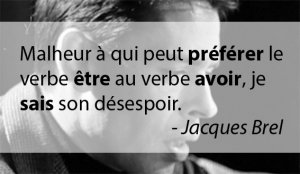 The termination of French verbs varies according to the mood, the tense, and grammatical person. Sometimes, it also varies according to the gender of the subject. The action of choosing the right termination for a verb is called conjugation (la conjugaison). The verbs which infinitive ends in -er belong to the first group. The verbs which infinitive ends in -ir belong to the second group. All the other verbs belong to the third group and are called irregular verbs. Later, if you want, you can read our complete article about French conjugation. We distinguish a few types of verbs that have different grammatical function or behaviour. Auxiliary verbs (les auxiliaires) are verbs that help in the conjugation of other verbs to form compound tenses (les temps composés). Hélène had been at her friend’s house. However, she had prefered not say anything to Pierre. Surely, with the first example, you’ll have noticed that the use of the auxiliary to have or to be in English doesn’t always correspond to the same auxiliary avoir or être in French. With each French verb, you’ll have to know which is the preferred auxiliary to use with it, although there is a logic. Semi-Auxiliary verbs (les verbes semi-auxiliaires) are verbs that are used as auxiliary verbs but that are not involved in the formation of compound tenses. In that manner, they help to express nuances in conjugation. Laisse-le essayer tout seul ! Let him try on his own! Marc fait nettoyer sa voiture tous les dimanches. Marc has his car washed every Sunday. Jean va entrer à l’université l’année prochaine. Jean is going to enter University next year. Pronominal verbs are verbs that are accompanied by a pronoun that refers to the subject. Their characteristic is the pronoun se which is present before the verb in the infinitive form, and what’s more, it must vary in agreement with the subject in the other forms. So, the pronominal verbs have three main functions that we’ll enumerate now. 1. Reflexive (verbe réfléchi) : the verb expresses an action that one does to himself. 2. Reciprocal (verbe réciproque) : the verb expresses an action done reciprocally one to another. Ils se lavent (l’un l’autre). 3. Passive (voix passive) : the verb expresses an action without naming who or what is doing that action. Les mains se lavent avec du savon. Hands must be washed with soap. Certain French have a pronominal form and a non-pronominal form, like laver (to wash) and se laver (as you saw in the previous examples) ; whereas other verbs like se souvenir (to remember)exist only at the pronominal form (these are the essentially pronominal verbs, verbes essentiellement pronominaux). direct (Complément d’objet direct = C.O.D) : whom or what the action is done to ; it’s never introduced by a preposition. indirect (Complément d’objet indirect = C.O.I) : whom or what indirectly receives the action that is done ; It’s always intrduced by a preposition. On the contrary, an intransitive verb is one that is not accompanied by such an object complement. Marc is talking to his friend. He’s probably telling him his adventures in details. When I was a child learning French grammar at school, they asked every pupil to buy an exemplary of a little book called “The Bescherelle”. It was a reference for all terminations and conjugations of all the French verbs, and it contained everything ! One would use it as we use a dictionary when in doubt about the right spelling of a word, only for grammatical purpose. Nowadays, at the digital age, I doubt many pupils still refer to this book in the paper format, but of course, it now exist as a tool online. Want to check it out ? It might help you anytime you’re in doubt about how to write any French verb at any mood, any tense, any person. Kind of a lifesaver ! Et voilà, we reached the end of our lessons about French verbs It isn’t a simple subject indeed, and you’ve taken a big step in your goal of understanding the French language. So, what’s next? Well, if you want to take a step further and deepen your study of French verbs, you might consider reading our course of conjugation. If you want something simpler to cool your brain down for a while, why not study the adverbs?